In June 1969, the Cuyahoga River caught fire. The river, which runs through Cleveland, Ohio, on its way to Lake Erie, had been polluted by years of discharges from industrial facilities. A flammable film floating on the water ignited, alerting the nation to the potential damage that pollutants can cause to our waterways. In 1970, the U.S. Environmental Protection Agency (EPA) was formed and quickly began efforts to reduce pollutant discharges to streams. By December 1970, the Refuse Act Permit Program was mandated to control water pollution, but was promptly struck down by the Federal District Court of Ohio (Kalur vs. Resor). An improved permit program was mandated in 1972 by the Federal Water Pollution Control Act (FWPCA) Amendments. Title IV of the FWPCA Amendments established the National Pollutant Discharge Elimination System (NPDES). The first NPDES permits regulated direct discharges from non-municipal industrial facilities. In 1977, the FWPCA was amended again. This revision, formally known as the Clean Water Act (CWA), established discharge limits for 65 priority pollutants and extended permit requirements to municipal wastewater treatment facilities. The Clean Water Act of 1987 further expanded the NPDES program to include non-point source discharges, such as stormwater runoff. The permitting of stormwater discharges was to be implemented in two phases. Phase I, promulgated in 1990, required NPDES permits from stormwater discharges from certain industrial categories, large construction sites (more than five acres of land disturbance), and storm sewer systems of medium and large municipalities (populations exceeding 100,000). Phase II, published in 1999, increased the regulated industrial categories and required permitting of small construction sites (between one and five acres of disturbance) and storm sewer systems of small municipalities (populations exceeding 10,000). After 30 years of NPDES permitting, considerable improvement has been made to the quality of our streams. In 1972, only one third of our nation's waterways were considered suitable for fishing and swimming. Today, two thirds of our waters are healthy enough for fishing and swimming. Presently, there are more than 400,000 facilities in 50 industrial categories that are required to maintain NPDES permits. NPDES permits can be complicated, but help is available. EPA offers a five-day training course for permit writers and has published the U.S. EPA NPDES Permit Writer's Manual (EPA-833-B-96-003), which contains several hundred pages of guidance on the preparation of permits. This article attempts to present the basics of federal NPDES permits and cannot serve as a stand-alone summary of applicable requirements (state or federal). Readers are urged to obtain further information from their permit issuing authority. Facility operators in Alaska, Arizona, Idaho, Massachusetts, New Hampshire, New Mexico or Puerto Rico will apply directly to EPA for permits. Information on EPA permits can be viewed on the internet at www.epa.gov/npdes. Operators in the remaining 44 states and the U.S. Virgin Islands will obtain permits from state programs, which may be more stringent than EPA requirements. Consequently, NPDES requirements in some states may differ from those presented here. An individual permit is specifically tailored to an individual facility. For example, an industrial manufacturing plant uses chemical ingredients and generates byproducts unique to that specific manufacturing process and could not be grouped with other facilities under a general permit. An individual permit lists specific pollution prevention practices, monitoring frequency and reporting requirements. Permits for most point source discharges of process wastewater will be individual permits. NPDES permits may be required for different kinds of discharges. To obtain a permit, industrial facilities must submit information, such as a description of activities conducted, site and contact information, location of outfalls, line drawings of water flow and process diagrams, description of wastewater treatment, average flows, maximum production, effluent characteristics and a list of toxic materials used or produced. The operator of the facility, not necessarily the owner, is required to apply for the permit at least 180 days before operations commence. The permittee must monitor discharges for pollutants and prepare annual monitoring reports. 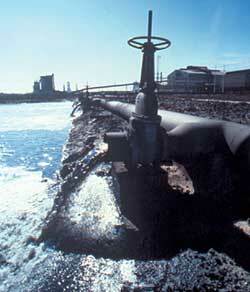 Discharges must be sampled for conventional pollutants and toxic pollutants reasonably expected to be present. Samples must be collected at each outfall unless it can be demonstrated that one outfall is representative of others. Commercial and industrial facilities that discharge non-process wastewater, such as non-contact cooling water, must also apply for a permit. The facility operator must submit contact information, description of nature of business and activities conducted, site location and contact information, location of outfalls and effluent characteristics. Annual monitoring is also required as described above. Facilities subject to stormwater limitations, new source performance standards, or toxic pollutant effluent standards under 40 CFR subchapter N.
Facilities classified as Standard Industrial Classification (SIC) Major Group 24 (except 2434), 26 (except 265 and 267), 28 (except 283), 29, 311, 32 (except 323), 33, 3441 and 373. Facilities classified as SIC Major Groups 10, 11, 12, 13 and 14 including mining operations and oil and gas exploration, production, processing or transmission facilities. Hazardous waste treatment, storage and disposal facilities. Landfills, land application sites and open dumps that receive industrial waste. Recycling facilities including metal scrapyards, battery reclaimers, salvage yards and automobile junkyards, including SIC 5015 and 5093. Steam electric power generating facilities including coal-handling sites. Transportation classified as SIC Major Groups 40, 41, 42 (except 4221-4225). 43, 44, 45, and 5171 which have vehicle maintenance shops, equipment cleaning operations or deicing operations. Treatment facilities treating domestic sewage including sites used for treatment, recycling, reclamation, disposal or land application. Construction activities where more than one acre of land is disturbed. Facilities classified as SIC Major Groups 20, 21, 22, 23, 2434, 25, 265, 267, 27, 283, 285, 30, 31 (except 311), 323, 34 (except 3441), 35, 36, 37 (except 373), 38, 39 and 4221-4225. A permit may also be required from any commercial or industrial facility if the NPDES permitting authority determines that the facility is contributing to a violation of a water quality standard or is a significant contributor of pollutants to waters of the United States. These facilities must have a stormwater pollution prevention plan, which identifies a pollution prevention team and sets forth on-site procedures for employee training, spill prevention, spill response, inspection requirements and required measures to treat stormwater runoff. Permittees that are industrial or commercial facilities must sample runoff from at least one representative storm each year. Runoff must be tested for conventional pollutants, as well as any toxic pollutants reasonably expected to be present. Annual reports must be prepared. A facility may obtain a conditional exclusion from NPDES if they can obtain a "No Exposure Certification" by demonstrating that industrial materials and operations are not exposed to stormwater runoff. NPDES Form 3510-11 must be completed and submitted to the issuing authority to apply for certification. This exclusion does not apply for construction activities. Public Education -- The permittee must make efforts to inform the public about the potential environmental impacts due to the improper handling and disposal of toxic materials. Public Involvement -- The permittee must involve the public in efforts, such as stream sampling, storm drain stenciling and river cleanup events. Construction Site Runoff -- The permittee must take action to enforce proper erosion control and pollution prevention measures on construction sites. System Maintenance -- The permittee must maintain the MS4 and make additions and repairs and needed so that stormwater can be effectively conveyed without discharging pollutants into waters of the United States. Illicit/Discharge and Connection --The permittee must implement an inspection program to locate and remedy improper connections to the MS4 and to identify and prosecute persons and facilities which illegally discharge pollutants. Good Housekeeping -- The permittee must implement stormwater pollution prevention programs at municipally owned industrial facilities, such as fuel depots and vehicle maintenance facilities. Construction sites with more than one acre of soil disturbance must also be permitted by NPDES. Unlike other permit types, requirements for small construction sites (between one and five acres of disturbance) are not detailed in the NPDES regulations so the permit issuing authority will be selecting permit requirements. They are, however, likely to resemble the requirements for large construction sites. Operators of large construction activities (greater than five acres of disturbance) are required to prepare and follow a stormwater pollution prevention plan and install best management practices to control sediment, petroleum and other pollutants. Monthly monitoring of runoff or receiving waters may also be required along with the preparation of monthly reports. Although progress has been made, one third of our nation's waterways are still impaired by pollution. NPDES Phase II has expanded the program and tightened controls on previously unregulated discharges. As program coverage expands, enforcement efforts must increase. In some states, as many as one half of regulated facilities do not have NPDES discharge permits. In many cases, facility operators are simply unaware of NPDES requirements. Phase II public education efforts may effectively improve public awareness and get the word out. Operators of facilities with unauthorized discharges will face enforcement action. The NPDES program continues to work towards its goal that discharges of toxic pollutants in toxic amounts be eliminated. Hopefully, we'll never again have to watch a river burning. This article originally appeared in the October 2002 issue of Environmental Protection, Vol. 13, No. 9, p. 32.